The kids will love this seven line Halloween sensory poem! Perfect if you're teaching the children how to write poetry. Halloween is the perfect time of year to inspire the kids to write some poetry, and our Halloween Sensory Poem Similes worksheets are a great way to get them started. Here's a perfect creative writing worksheet for Halloween! Can the kids use our prompts to help them write a couple of sentences about the haunted house in the picture? The fun monster picture on this writing prompt is bound to inspire the kids to write a couple of descriptive sentences! 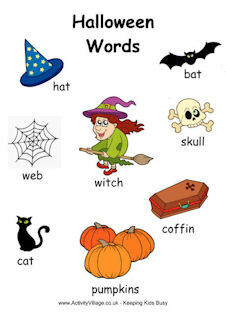 Watch this spooky scene pdf slideshow with the kids on your computer screen or whiteboard and ask them to brainstorm words, feeling and ideas. A fun way to spark the imagination and inspire some creative writing! What do you enjoy most about trick or treating? Write a paragraph about it, and another paragraph describing the delicious looking candy! 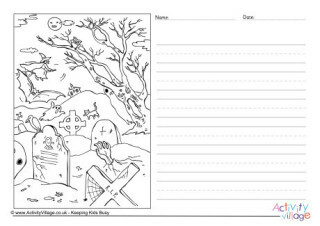 Even the most reluctant writers will enjoy writing about trick or treating on this fun Halloween-themed worksheet. Spark off some creative writing at Halloween or any time of year with this fun Vampire paragraph writing prompt. Our writing prompts are a great way to fire the imagination! Can the children write two sentences about the vampire, one describing him and the other describing where he might live? There have been many spooky stories written about witches, and now the children can write their own paragraphs about a witch and a spell she has cast with the help of this prompting worksheet.